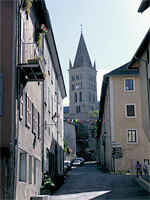 Embrun is at 870 meters altitude and is a small town between Gap and Briançon. 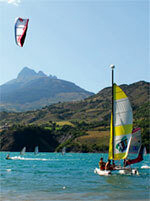 Embrun has about 7000 inhabitants, and is near the largest reservoir in Europe - the Lac de Serre-Ponçon. Embrun is only 5 minutes walk from the campsite. The town is known for its magnificent cathedral Notre-Dame du Real, built between 1170 and 1220, and dedicated to the Virgin Mary. 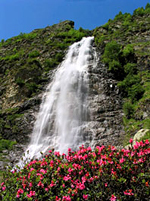 This is the most important religious monument of the french Alps, and a visit is worthwhile. You can stroll among the many boutiques after a drink at oneof the many outdoor cafes as a welcome treat.If you wander through the colorful streets you will discover the many fountains.renaissance façades, passages,sundials and statues, traces of the rich past of Embrun. Wednesday and Saturday mornings offer the best local produce on the lively market. 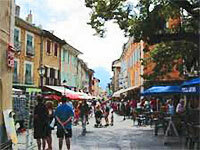 Embrun is known as the Nice of the Southern Alps.